Christmas is big here in Japan, but I'm not really into it. You see, I'm a pagan. Sure, I like the sparkling lights, the fried chicken, dressing up for date night on or near Christmas Day. But it doesn't light my fire. Christmas in Japan, unless you're Christian, is largely bereft of its religious origins, which I suppose is inevitable considering how commercialized and sentimental it has become in North America and elsewhere. As my spiritual orientation is centered on nature, I celebrate the lunar and solar events, the seasons, and talk to animals and hug trees. I'm one of those people. 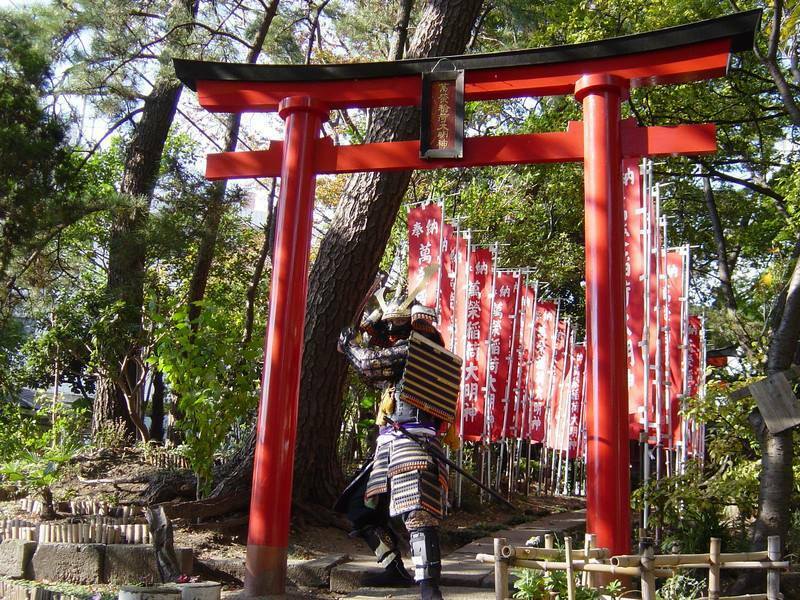 One of the pro-pagan aspects of living in Japan is that the spring and autumn equinoxes are national holidays. 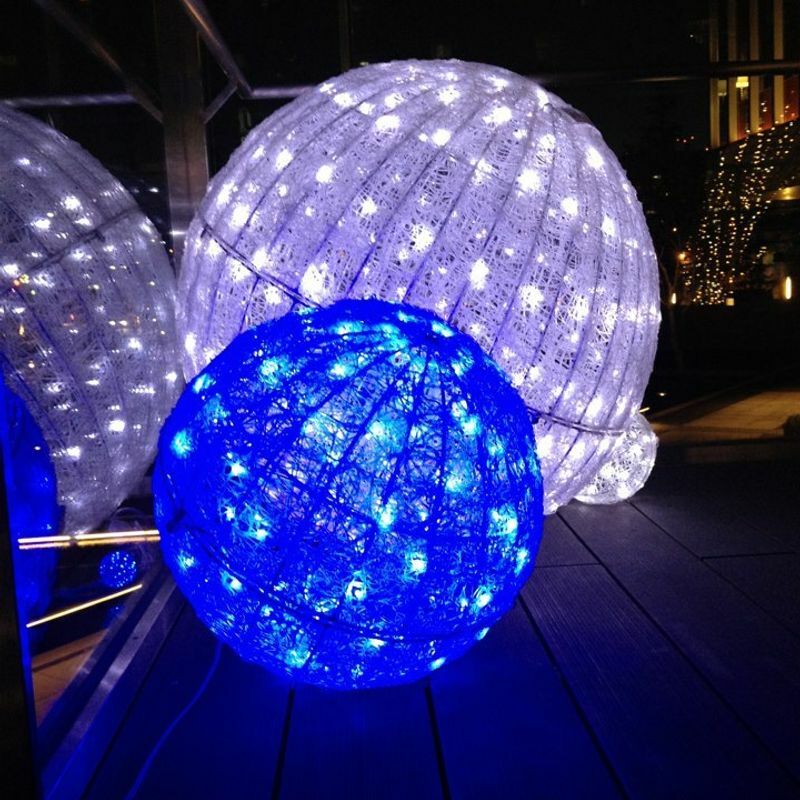 Nationally observed celebrations also fall close to the summer and winter solstices. So I feel fortunate that I can take a break to appreciate mother nature. I was wondering about how I could celebrate this year's winter solstice when I passed through Shimizu Park in Noda City. I always look at the sign board to see what's on. Usually, it simply indicates the next goma taki, or fire ritual, that the priest holds once a month in the Fudo temple. But this time, it indicates an event on the winter solstice. Hoshi matsuri, a star festival, is going to be held on the Saturday closest to the longest night and shortest day of the year. I was very curious so I did what I always do when I encounter something I don't know about Japanese religion - I Googled it. The star festival is a tradition that has its origins in the Heian Period around the time that the Buddhist sage Kukai brought mandalas along with scriptures and teachings from China to Japan. The mandala in most Buddhist traditions is an image of the cosmos depicting Buddhist symbols and Buddha figures. 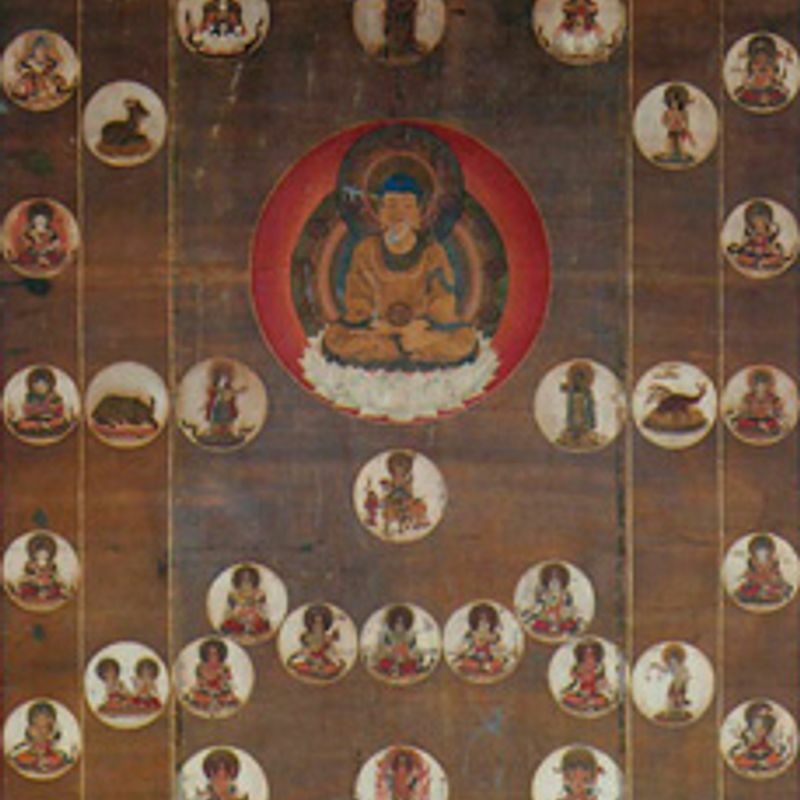 But Tendai and Shingon schools' artists and monks used the art form to depict celestial bodies in star mandalas, unique to Japanese Buddhism. The stars they depicted were part of a system of astrology. The mandalas usually had images of Buddhist deities representing the sun, the moon, the five known planets, some mythical heavenly bodies, the seven stars of the Big Dipper (Ursa Major), surrounded by lunar calendars in cycles of 12 years and 28 lunar phases. The position of one of the seven stars in relation to the planets, the sun and lunar cycles on the day of your birth determined your fate. This complex and beautiful system of astrology didn't really spread to other Buddhist schools, and the rituals associated with divining your fortune via this system aren't widely practiced in Japan. But the astrological reckoning from Asian tradition lives on in the names of the days of the week in the Japanese language. Sunday is Nichiyoubi, Sun-day, Monday is Getsuyoubi, Moon-day. The other days of the week are named after the stars - kayoubi after Mars, suiyoubi for Mercury, mokuyoubi for Jupiter, kinyoubi for Venus, and doyoubi for Saturn. 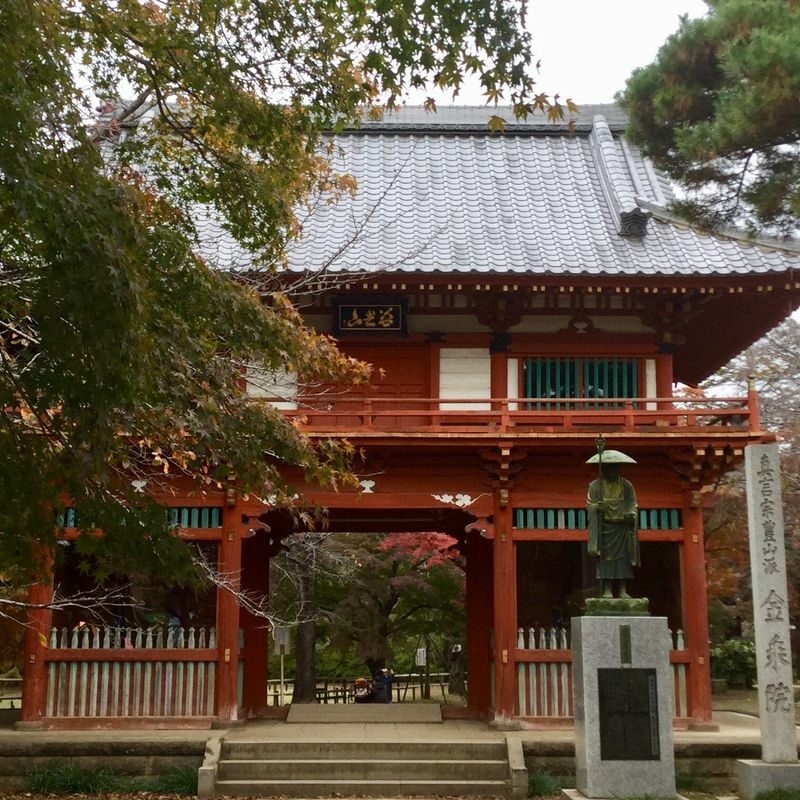 After some research, I found out that a number of Shingon temples besides my local one, also associated with Fudomyou, the fierce looking Buddhist deity, hold star festivals on the winter solstice. At Hino City, Takahata Fudoson holds their star festival ritual on the evening of December 22nd. Kawagoe Naritasan Temple also has their star festival on the 22nd. 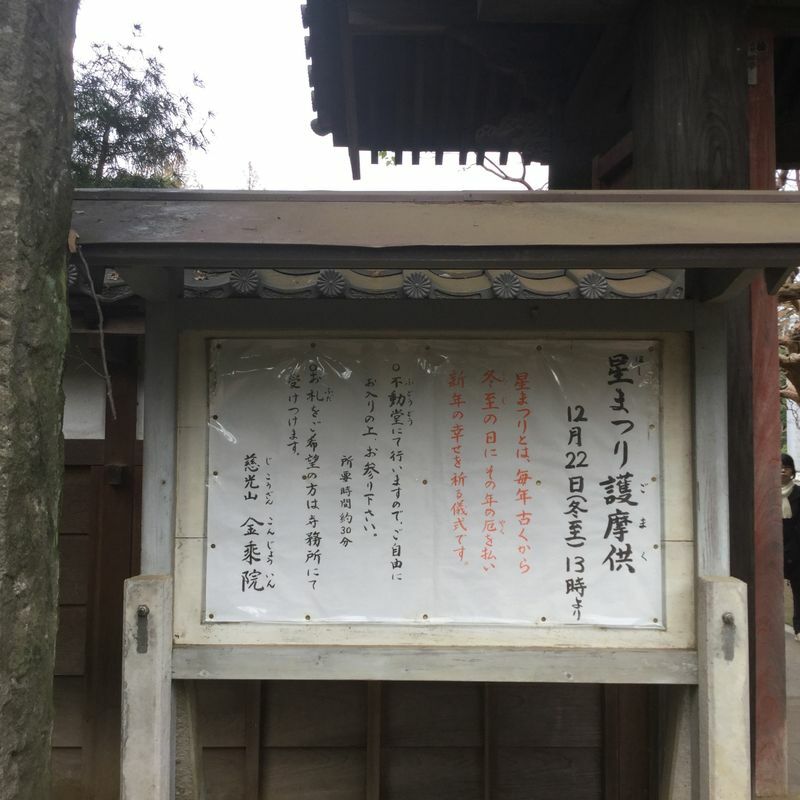 Curiously, Naritasan's calendar of events indicates that this head temple holds theirs for seven days following Setsubun. This makes sense when you consider the star festival as a new year event. Today, Setsubun is associated with bean throwing for good luck and is celebrated on a day fixed on the western calendar, but it used to mark the beginning of the lunar new year. The lunar calendar was observed in Japan until 1873, and has a few relic events such as this. You can consult Naritasan's online schedule to find out which star is yours. Happy holidays, Salubrious Solstice, Merry Christmas, Yipee Yule, and Happy New Year, all.